Six recently released printers from Canon promise faster printing speeds and upgraded software, particularly for mobile and cloud applications. 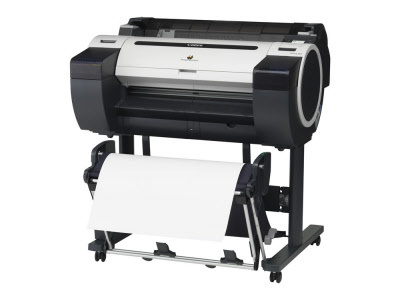 The new printers—all six in its imagePROGRAF line—include four new 5-color, large-format inkjet printers (the 36-inch iPF785 and iPF780; and the 24-inch iPF685 and iPF680 (pictured) models) and two large-format imaging systems/printers (the iPF785 MFP M40 and iPF780 MFP M40). According to the company, the 36-inch models are specifically designed for high-quality and oversized jobs and can print at speeds of up to 21 seconds for an Arch D (24- by 36-inches) print. They now support 300 ml ink tanks, and a sub-ink tank system, which allows users to replace empty ink tanks without stopping the printer. Both models come with a 320GB internal hard drive that can be used for personal mailbox space and storage for up to 500 print jobs. The large-format imaging systems, also called scan-to-print systems, feature their own standalone computers and an M40 scanner with a maximum optical resolution of 1200 dpi and scan speeds of up to 13 inches per second for monochrome; 3 inches per second for color. They can scan documents up to 590 inches as a TIFF file, or 315 inches as a PDF or JPEG. Also compatible with the new devices: the company's new mobile app for iPads, imagePROGRAF Print Utility, which lets users proof and print documents from their tablets. "The models also deliver higher color gamut, richer color saturation, more distinct fine lines and more natural-looking skin tones," said David Sweetnam, head of Research and Lab Services for BLI, referring to all six printers. "The models further deliver excellent GIS/CAD/AEC graphics with an improved depth of field in GIS graphics, even on plain paper, delivering a more realistic 3D rendering of topographical features."